Picking our annual five-things-to-watch list helps Radiology Today focus on some key items we—and you—should be paying attention to in the coming year. Accurately predicting the answers to the questions the list raises would be genius, which we’re not claiming. But, here’s hoping your focus may inspire some genius on how to handle these five issues facing imaging in 2014 and beyond. 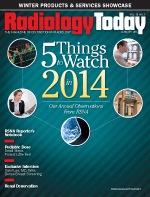 How will radiology practice change in the coming year and the ones to follow? That answer isn’t quite clear, but radiologists should anticipate changes in what they are asked to do and how they are paid. For most of the past two decades, radiologists have served patients as well as prospered professionally and economically by reading and reporting an ever-growing volume of studies. Workflow was organized to maximize radiologists’ capacity to produce in the reading room, driven by robust growth in imaging exams. Similarly, the response to fee-for-service reimbursement reductions was the same: read more cases. A timely, accurate interpretation that informs treatment still is the core of radiology care, but other parts of the equation, including economics, are changing. Instead of just reading exams at an ever-increasing rate, some people in the field see radiologists being asked to return to their role as the doctor’s doctor. Robust imaging utilization growth cannot be expected to offset declining reimbursement. Collaboration, consults, and patient accessibility are increasing demands. Educating referrers and serving as imaging’s gatekeeper are more hats that may be thrust at a radiologist, who may need to become a hydra to wear them all. The ACR calls this new radiology practice Imaging 3.0, and health care reform increasingly labels it as value-based imaging. Whatever the name, hospitals and health systems will require more from radiologists, to some extent diverting them from interpreting studies in the reading room. Imaging will lose some of its status and influence as it becomes less of a hospital profit center. Patient satisfaction, educating referrers, and providing the right test the first time will become larger factors in evaluating imaging organizations. Volume alone will not be the driving metric. The shift from fee-for-service imaging toward value-based imaging—albeit with no clear definition of value—will take some time, but forward-looking radiology groups, hospitals, and health systems are busy investigating how they’ll compete in the coming, at least anticipated, environment. How will radiology fit into the world of accountable care organizations (ACOs) being ushered in by the Affordable Care Act (ACA)? Radiology very much wants s to know, if discussion at RSNA 2013 is any indication. Change, particularly the kind threatening to alter how providers are paid, draws everyone’s attention. The new year ushers in the federal and state insurance exchanges and the expansion of Medicaid that some expect to flood physicians and hospitals with newly insured patients seeking care—presuming the miserably malfunctioning federal insurance exchange website permits a flood of enrollees anytime soon. If ACOs become a large factor in health care, how would a resurgence of capitated health care play out? Capitation worries many physicians, perhaps more than it should. The first round of capitation in the 1990s did not fail because physicians couldn’t prosper in a capitated environment; it failed largely because patients rejected having their care managed by a gatekeeper and ultimately forced most insurers away from policies relying on the strict gatekeeper model. The growing portion of health care costs paid directly by the patient may change that dynamic. In the shorter term, imaging organizations are curious to see whether the anticipated wave of new patients needing imaging will offset some of the recent downward trends in imaging utilization and reimbursement cuts in the Medicare Physician Fee Schedule and the Hospital Outpatient Prospective Payment System. In visits to at least a half-dozen vendors, software reps offered a promotional display showing many of an organization’s information sources (eg, PACS, RIS, EMR) that their software could extract data from and put into a database. By uniting data previously tucked away in disparate data silos, imaging leaders could make better data-driven decisions. When I asked what their software could show me, the answer was pretty much “whatever you want.” The trouble is many organizations seem to have little idea of what they really want to know from all that data. Many practices and hospitals have ideas about using analytics to assess productivity and some aspects of workflow. A smaller number are investigating analytics tools to look at patient satisfaction and demonstrate quality, two areas garnering more attention as the ACA expands in 2014. Informatics tools such as dose-tracking software increasingly are being used to comply with state reporting laws, but in many cases, those solutions do little more than pull data from the scanners and deposit them in the report to comply with reporting laws. To their credit, radiologists and imaging administrators seem to know that gathering and using data will prove important but are still figuring out how they’ll do it in their setting. That will be interesting to watch in 2014. As more states require that women be notified when they have dense breast tissue—14 states as this issue goes to press—patients, their physicians, and breast imagers are deciding what to do with that information. When a woman receives a state-mandated letter informing her that she may have dense breast tissue, she generally is directed to discuss the matter with her physician to decide how to proceed. Exactly what would happen next was a topic of much discussion in Chicago. Breast ultrasound (both automated and otherwise), breast MRI, molecular breast imaging, and digital breast tomosynthesis all were discussed in presentations in various sessions. Similarly, women’s health vendors showed all those modalities in the exhibit halls. In addition to those modalities designed to provide information when mammography may not, computer-assisted detection software such as from VuCOMP and Volpara Solutions offer breast density assessment systems designed to provide a more consistent measure of breast density. In the absence of clear guidelines on breast density and how to handle it, many individual imaging organizations and clinicians will establish or adjust their protocols and procedures for notifying women who may have dense breast tissue and managing any patients who are sent notification letters. It’s unrealistic to leave the implementation of ICD-10 off any health care list of things to watch in 2014. The long-delayed changed to medical billing and coding will occur on October 1. It remains to be seen how much of a disruption it will cause. Predictions range from a modest slowdown in claims processing—with an increase in denials and claims that need to be reworked—to a cash flow standstill that will require facilities to have significant additional credit lines to carry it through the transition period. What do we see in our crystal ball? The amount of trouble with the transition to ICD-10 will be inversely proportional to the amount of effort an organization puts into preparing for the transition to the new coding system.